This is a cartoon illustration based on the iconic sci-fi movie monster, designed by Swiss surrealist painter, H.R. Giger. Of course, my version isn’t anywhere as terrifying as his creature, but I like to think I’ve managed to capture an air of menace about him. His trademark elongated head and deadly protruding second jaw are also present, as well as that long tail ending in a deadly stinger! 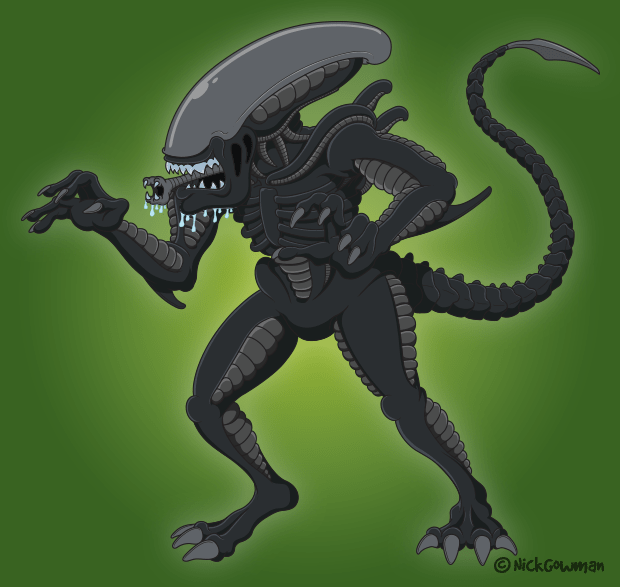 If you’d like to know a little more about the process of creating my Xenomorph cartoon, check out my Alien Day blog post.